"…all these achievements belong to God, because nothing is possible without him. All I had, have, and will have is from Him and belongs to Him." "In summation I believe that my accomplishments are also responsibilities because God has blessed me much and therefore it is my responsibility to give back to my church and community. With leadership comes responsibility and with authority come duty: duty to God and duty to my people." These statements are not from monks or seminary students; they are from 19-21 year old college and university students with an array of awards in academics, athletics, and the arts. They are majoring in corporate law, pharmacy, engineering and business. 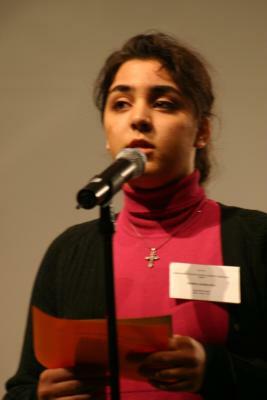 Haymanoota (Christian faith), Yulpana (Thirst for learning), Umta (nation) appear to be the motto, not necessarily in that order, of the 98% of the 9 candidates that participated in the Assyrian Youth Excellence Contest during the 2004 AANF Convention that took place in early September in Santa Clara Convention Center. 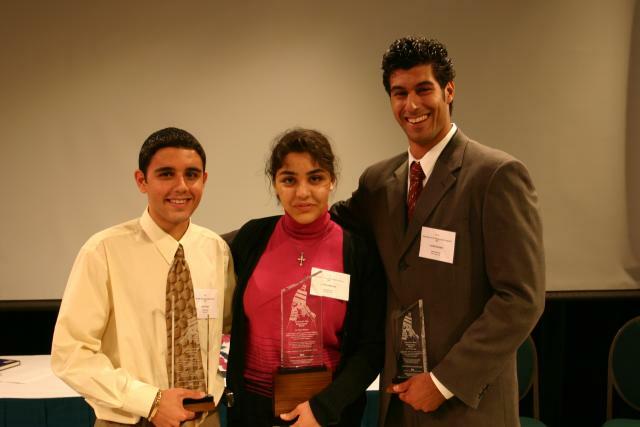 This was a truly exceptional group of young Assyrian scholars. 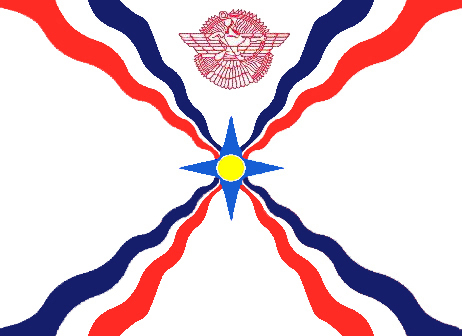 Of the 9, 5 had a diploma in Assyrian language (had completed 6 levels of language classes) and were voluntary instructors of the Assyrian language in their respective church as well as other churches. The rest all spoke Assyrian and had reading and writing skills as well. It is interesting to note that whether they were born in Iran or in the U.S.A., these young men and women, with the exception of one, learned the Assyrian language at their respective church, and not in civic organizations. We have therefore to admit that the guardians of our language today are the churches. Getting to know these young scholars is a memorable experience. Sabrina Nisan is only 17, yet she has already graduated from Junior College and is taking classes in State University of Stanislaus, Turlock. Of a mixed Assyrian (father) and American (mother) parentage, Sabrina is fluent in Assyrian at a time that full-blooded Assyrians fail to learn the mother tongue in Diaspora. In the case of Sabrina, it is of course the father tongue. She has learned that from her mother who is herself fluent in Assyrian, and both mother and daughter currently teach it to others. 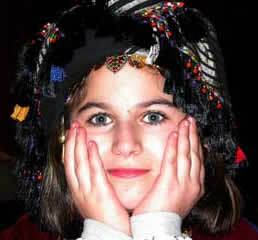 Sabrina intends to major in Middle Eastern Studies, and is learning Arabic for that purpose. Shariman Mado is a student at York University Ontario, Canada majoring in political Science and Philosophy. She is the youngest Assyrian activist there is. About her future plans she writes: “My future plans will be to pursue a Master’s degree in the field of Political Science, particularly human rights in the Middle East, Assyrians being the primary subject matter. But Shariman has not waited to graduate. She is already deeply involved with Assyrian issues. She works closely with the Council for Assyrian Research and Development (CARD) to raise awareness in the various Canadian media regarding the Assyrian situation in the Middle East. She is also a member of the Assyrian Students Association at York University where they hold an Assyrian Genocide Awareness day and a Cultural Awareness Day during multicultural week. But most impressive is the grant she has received after proposing a study on Assyrians under the Kurdish Administration in Northern Iraq to do an internship in Brussels, Belgium. She will be working with Human Rights Without Frontiers and the United Nations in creating a handbook that will be used for establishing Assyrian Indigenous Status in our homeland. 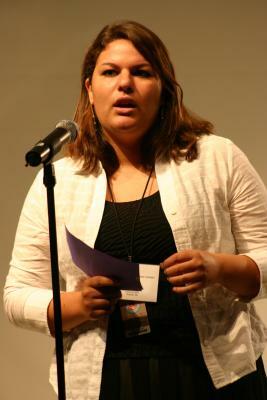 Another activist but not in political, rather in social and cultural affairs, is Ramina Sarmicanic. She has put her language skills: Assyrian, Farsi, French, and English in the service of her people as a translator making information available to Assyrians across languages. In addition she is well versed in another language, the language of music. She plays classical music on the piano. Having spent most of her 19 years of life in Iran, She has been a contributor to a youth magazine and the adult publication Sapra. In that respect she writes: “My role was translating French texts to Farsi and Assyrian. Another role of mine involved programs for the Assyrian Martyr’s Day, commemoration of famous poets, designers and musicians such as William Daniel, John Alkhas, George Bet Atanus and Hanibal Alkhas. In these programs I would play the music on piano or read Assyrian poetry.” In 2001 she had the opportunity to travel to Germany and Belgium where she did piano accompaniment to the songs of William Daniel in several concerts. The best part about knowing how to play the piano, according to her “is not winning contests or playing Assyrian songs, but proving that Assyrians contributed to the world during their history. Assyrians invented musical notes, so my passion for the piano is good evidence against people who say that everything great about Assyrians is dead and in the past.” Ramina’s goal in academics is to pursue a career in Biochemistry. Carolyn Odisho is currently a student at Arizona State University West Campus (ASUW), working towards a bachelor of science, aiming ultimately to become a corporate lawyer. Knowing Carolyn, is to a large extent, knowing her poetry. 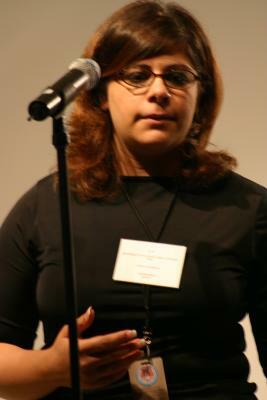 The following piece is her own translation into English of a poem she wrote in Assyrian. Participation in the Assyrian Youth Excellence Contest was a two-day event involving a ranking process based on both objective criteria such as GPA, points earned on awards and letters of recommendation; score tests on the Assyrian history in English, and an optional reading and writing test in the Assyrian language, and subjective criteria such as interactive skills, talent show, or other types of presentations. 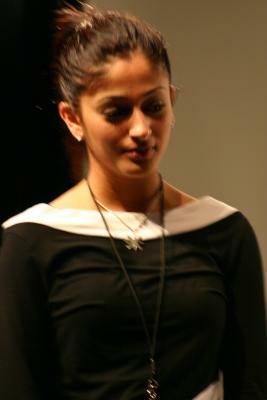 For the 9 contestants there was a judging panel of 7 members, selected from different States. 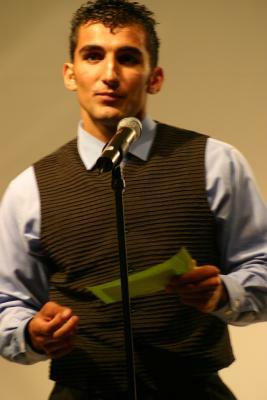 The winners received their rewards in front of an audience of 250 people. Cash prizes were $1500.00, $1000.00, and $500.00 respectively. All winners received the Ashur Banipal Trophy. In addition, all contestants received a beautiful book on Ancient Mesopotamia. In addition, Zinda Magazine pledged a free ticket to the winner of the contest at Narsai David’s gala dinner, “A Taste of Mediterranean”. Since a truly exceptional group of young scholars outstanding in academics and athletics, as well as the arts had participated in the YEC contest, we thought they all deserved to be the winners. Our wish was in fact fulfilled, because a person from the audience, who wished to remain anonymous, donated $500.00 cash prize for each contestant. Whoever you are, wherever you are, I thank you greatly on behalf of all of us. And we used to play in the neighborhood. About our country and how peaceful it was. And the many inventions that came from them. For Example: The Wheel, The Calendar, The Seasons, and The Days of the Week. These are things the whole world uses today. But it will take me a month to tell you what else we invented. There were stories of wars and bloodshed. With the Simele Massacre of how our people were killed for a cause. But she used to tell us that we still kept our faith. For no pride but for the faith that our country will one day stand tall again. People will then realize that Atouraye are still around and alive. They would fight for their land to take it back from the enemy. They would sacrifice anything to take back their land. By training and teaching the young generation to fight and defend their country. They organized a strong army to win back all of Bet-Nahrain. (ZNDA: Baghdad) Fifteen political groups called today for a six-month postponement of elections scheduled for 30 January 30. The groups included some of the most prominent political parties in Iraq, including that led by Prime Minister Ayad Allawi, Adnan Pachachi, and the two main Kurdish parties. The 15 groups and dozens of individual political and religious figures issued a collective statement after holding an impassioned two-hour afternoon meeting at the Baghdad home of Dr. Pachachi. "The participants call to postpone the elections for six months in order to address the current security situation and to complete the necessary administrative, technical and systematic arrangements," the representatives at the meeting said. Most of the groups are secular and led by Sunni Arabs. Shiites, who make up at least 60 percent of the population, have been adamant about holding elections by the end of January. Sunni Arabs, and Kurds to a lesser degree, have expressed fears that Shiites will vastly dominate the new government and exercise their power unchecked. An organizer with the Iraqi electoral commission said in an interview that the commissioners will discuss the new demands for an election delay, but expressed doubt that there would be any changes. Iraqis are to elect members of a 275-seat national assembly that will choose a prime minister and other executives from its ranks. The assembly is also charged with writing a permanent constitution. Elections for a full-term government are planned for the end of 2005. Two other sets of elections are planned for Jan. 30 - one for leaders of the country's 18 provinces and one for a Kurdistan Assembly in the north. 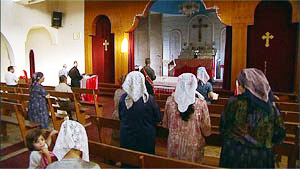 The escalating attacks and violence against ChaldoAssyrian Christians (also known as Assyrians, Chaldeans, and Syriacs) in Iraq have led to a general sense of terror within the community. The systematic and sophisticated Church bombings of August 1, October 16, and November 8 have been supplemented by nearly daily reports of abductions, beheadings, burnings, and killings of innocent ChaldoAssyrian civilians. An ever increasing number of ChaldoAssyrians have been targeted and killed in the past 2 months alone. Other forms of pressure and threats include pressure to sell lands, the coercion of woman to wear veils, and the abduction of women for marriage against their will. The continuing onslaught against the vulnerable ChaldoAssyrian civilian population is perpetrated with the specific intent of terrorizing the indigenous Christian population into leaving their homes. Establish an interim Safe Haven in the Nineveh Plain to be maintained and enforced by ChaldoAssyrians in order to protect and preserve the historic lands of the ChaldoAssyrian people and to serve as a sanctuary for threatened and internally displaced ChaldoAssyrians. Following the first Gulf War, the international community established a Safe Haven in northern Iraq to protect civilians from attacks by the regime of Saddam Hussein. Today, the attacks against ChaldoAssyrians are even more ominous and threatening. With reports of tens of thousands of ChaldoAssyrians leaving Iraq, there now exists the real possibility of the extinction of the indigenous ChaldoAssyrian people in Iraq for the first time in their 6700 year continuous existence. The final litmus test for the Iraqi government's and the international community's genuine commitment to pluralism and democracy remains the preservation of the indigenous ChaldoAssyrian people of Iraq. Title: "Are Human Rights Exportable?" French Title: "Les droits de l'homme sont-ils exportables?" Devant la moralisation à l'excès des droits de l'homme et leur idéologisation à l'échelle planétaire qui a conduit à des dérives fâcheuses, comme l'effacement des différences culturelles et l'uniformisation, la diabolisation de l'Etat ramené à sa fonction répressive, l'inflation des textes et leur extension à l'infini, le recours aux droits de l'homme comme instrument de pression politique et le conditionnement de l'aide économique et financière, le droit, voire le devoir d'ingérence politique, la rhétorique sur la bonne gouvernance, une justice pénale internationale confuse et sélective, au-dessus des Etats-nations, et la fièvre “démocratique” par dessus la volonté des peuples, il est venu le temps de procéder à une analyse scientifique des textes fondateurs pour les rendre intelligibles. Quand bien même les droits de l'homme étaient devenus une bible, or même la parole révélée et les textes canoniques sont passés au crible de l'analyse exégétique, de la critique historique et de l'herméneutique. Ce qui ne les a pas empêché de survivre. Il doit en être de même pour les droits de l'homme qui ne doivent pas devenir une nouvelle théologie, au pire une mystique. Car loin d'être un culte, ils sont des actes historiques et non hagiographiques. Or pour qu'ils soient intelligibles et sciemment évalués, les droits de l'homme ont besoin d'être situés dans l'espace et l'époque qui les a vu naître; autrement, ils demeurent un discours sans topique, idéologique et moralisant, démesuré par ses promesses car sans effet réel, faute d'expression spécifique et d'appropriation par les hommes et les peuples. En essayant d'interroger le concept d'universalité des droits de l'homme, présenté comme indiscutablement valable pour tous les hommes, on constate qu'il est limité et non valide, pêche par excès d'utopie et irréel. La question n'est pas de nier une essence générique de l'homme et des valeurs universelles (comme la dignité inhérente à tout être humain), ni de critiquer les droits de l'homme d'un point de vue moral ou de douter des bonnes intentions de leurs défenseurs, mais de montrer que les “droits de l'homme” n'ont pas véritablement une base universelle, ni de signification en dehors du temps. Ils s'inscrivent dans la géographie et l'histoire où ils prennent tout leur sens et, comme tels, varient selon les sociétés et se déploient différemment à travers l'espace, le temps et le moment. D'ailleurs, quand on se plonge dans l'étude des textes fondateurs, tous européens, on s'aperçoit qu'ils ont toujours porté la marque du lieu, des pays, des périodes et des personnes qui les ont enfantés et ce, depuis la Grande Charte de 1215; à telle enseigne qu'entre le point de départ et le point d'arrivée, les différences sont telles qu'on peut s'interroger sur la validité universelle des déclarations initiales. Par une étude comparative détaillée des textes et des philosophies qui les sous-tendent, ce travail cherche à insérer les textes des droits de l'homme dans leur contexte historique et géographique, et montrer par là qu'ils n'ont rien de constant. Ils sont tributaires des cultures et des imaginaires collectifs, des représentations nationales et des déterminants sociaux, et dépendent largement de leur instrumentalisation par les Etats. Au terme de vingt années d'enseignement et de réflexion sur les droits de l'homme, ce travail décrit et analyse leur parcours et montre que la Déclaration universelle de 1948 se trouve complétée, si ce n'est contredite, par une série de textes ultérieurs qui ont élargi son assise humaniste en intégrant de multiples apports, à la conjonction de l'individuel et du collectif. La première partie du livre procède d'une analyse philosophique et anthropologique des droits de l'homme en les confrontant aux civilisations et cultures. C'est un examen de leurs fondements intellectuels. La deuxième partie retrace l'histoire et le contexte de préparation de la Déclaration de 1948, les critiques formulées alors, ainsi que le débat en France sur la refonte de la Déclaration de 1789. Quant au troisième volet, il aborde en détail le processus d'internationalisation des droits de l'homme depuis 1948 et leur instrumentalisation par les Etats. A travers cette étude textuelle, on s'aperçoit que le monde des droits de l'homme est très divers, voire hétérogène. Devant une telle variété, peut-on continuer à fonctionner comme si la Déclaration du 10 décembre 1948 était universelle? Les réalités du monde exigent sa réécriture. En attendant une nouvelle Déclaration des droits de l'homme, qui tienne compte du parcours suivi depuis 1948, des particularités des uns et des autres, et qui soit agréée par tous les peuples, l'auteur plaide d'abord pour un large débat international qui rapprocherait les différentes conceptions des droits de l'homme sur des dénominateurs communs. Dans l'étape actuelle, il privilégie l'interactionnisme à l'universalisme, car ce dernier nie la notion de corps politique national et de souveraineté populaire. Our Chaldean people are an inseparable part of our big nationality in all of its names, viz. Chaldean, Assyrian and Syrian. The nationality whose people had the honor of building the most ancient and deepest civilization history has ever known on the land of Mesopotamia. The Chaldean nationality issue along with its complexities and overlap has occupied the mind of many of the educated and interested people and active dignitaries in the Chaldean society for over the past three decades. In spite of plenty of materialistic and human capabilities and abilities that our Chaldean people have, they were generally far away from investment and mobilization for the national, serious, fruitful and promising work for some objective and subjective reasons. However, on the other hand our Chaldean people are proud of the national and democratic role its people have undertaken in the modern history of Iraq since the foundation of the Country of Iraq. Many of them had their honorable role in the establishment of many ancient national parties and different vocational organizations, viz. (Unions, Clubs, Associations ...) which have played and are still playing a pioneering role in the political history of Iraq. On this way, our national people have the honor of struggle in the democratic and national tasks. They have right from the beginning recognized that the struggle for their national legislative rights is inseparable from the issue of struggle for the national liberation and Democracy. The issue for which our people offered huge numbers of martyrs on various stages. In spite of many attempts to establish and form establishments and organizations that upgrade the national action and activity, they, alas to say, couldn’t stand stable and continue because of subjective reasons concerned with the nature of the approach they adopted and the experience and satisfaction of the people in charge of them and the absence of the basics and democratic conventions in their structure and inability of attracting wider groups of our people to prepare and get ready to upgrade with the responsibilities of these organizations. 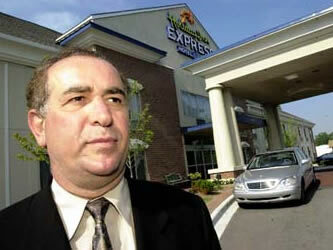 Jamal Kalabat, owner of Holiday Inn Express in Waterford, Michigan is part of the steering committees for the Chaldean-Democratic Forum and the Chaldean American Chamber of Commerce. 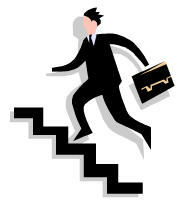 The Chamber expects to enroll about 2,000 members in the next five years. Today and under the new Iraq; the promising Iraq for the national, religious and political people of all its components, we are required particularly at this time and more urgently than any other time to work together and cooperate faithfully and constructively to accomplish our national duty towards our people overseas and in the Homeland, Iraq. Therefore, we find that it’s a must that we the people of this ancient and ever giving nationality should exert ourselves to establish a political organization that gathers, unifies and materializes the aspirations of the people of our nationality towards the national work by cooperating with all the national, serious and loyal establishments and organizations. The initiative of our loyal people in Iraq by forming a coordinate council (the national Chaldio-Assyrian) for all of the national components of our people is considered to be a great and blessed initiative and it’s a basic step into this correct and sound path. In this respect, we have a great lesson that we all should work together to ask for inspiration from it and find us a suitable formula to enhance this true orientation. Our Chaldio-Assyrian Nationality is expecting from all of its people to unite their efforts and overcome the complexities of the past and place the future of their people and its interest above all considerations. Therefore, our people are required to encourage and embrace all the serious and sincere establishments by offering all kinds of support and assistance and help all the sincere, whether they are individuals or establishments to achieve the sublime and noble goals of our people. Trying to find the best and most successful formulae for the coordination and joint cooperation with all the active establishments and individuals that believe in the unity of our Chaldio-Assyrian Nationality. Coordinating with all of the Iraqi establishments and gatherings acting in the overseas arena. Developing the national and human feeling of our people and encouraging them to be active and to interact with this orientation. Trying to revive the national and human tradition of our nationality and encourage the revival of our language and the necessity of teaching it to new generations. That’s, in addition to encouraging and embracing the components of our culture and folk arts. Providing the best means to bring forward the role of the woman in the society and giving her the opportunity to show her abilities in various domains of life. Commissioning extraordinary importance to the youth, especially those who have been born and brought up overseas and giving them the opportunity to express their energies and capabilities. Ensuring our national, political, administrative, religious and cultural rights in the permanent constitution of Iraq. Struggling for the sake of creating democratic, multiplicative, parliamentary and independent Iraq that ensures the human rights. Supporting the National, Chaldio-Assyrian Council that has been recently formed in Iraq and coordinating and cooperating with it as being considered the best formula to represent our people. Adopting and contributing to the projects that assist in improving the conditions of our people in their cities and villages in various aspects in the Homeland. Arranging visits and trips for the people of our community to visit their Homeland and particularly the youth who haven’t had the opportunity to visit the land of their fathers and ancestors. Encouraging the people of our community to establish investment projects and transfer experience, knowledge and technology to Iraq. The Chaldean Democratic Forum (CDF) is a project to establish a political Secular Chaldean Entity, based on the authentic fact that Chaldeans, Assyrians and Syriacs belong to one nation rooted deeply in the land of Today's Iraq.. The different names associated with this nation represent the succession of this culture over different historical civilizations implanted on the land between two rivers; Iraq. The formulation of the Chaldean Democratic Forum emerges as a response to the immediate present national and provincial necessity for such organization. The CDF stands on comprehensive democratic and patriotic outlook. Its work and activities will contribute in creating a political balance within the Chaldo-Assyrian frame. It also adds political and democratic dimension to the Iraqi political arena, through diligent and active mobilization of the inherent potentials for the Chaldeans on all levels. This Chaldean Democratic project has emerged from the state of Michigan, where the largest Chaldean community resides, not only nationwide, but also worldwide. Despite the popularity of this project among the Chaldean community, and especially the Chaldean activists and vanguard, this project aspires to cover all regions where Chaldeans exist, especially the motherland; Iraq where an ongoing effort of coordination is taking place with the Chaldean elite to form the center for this organization and initiate the call to hold its first foundational conference. The CDF strives to contribute in the efforts of rebuilding the Democratic confederate Iraq, that guarantees the rights of all its ethnic and religious components, among which, is our Assyrian nation, and to have these rights enlisted and assured in the forthcoming constitution. The CDF will commit itself to work to strengthen ties of Iraqi communities abroad, specifically the Chaldean community, with the motherland; Iraq. And also to encourage and exploit the potentials possessed by this community that is vital to the process of rebuilding Iraq. The CDF strives to establish an influential political lobby in the new home countries to serve our national goals and to defend our rights and protects its freedom and dignity. The CDF looks forward to coordinate and cooperate with all organizations with similar interests to embody whatever goal for the good of our Chaldo-Assyrian nation and our Iraqi people. Our Forum, “The Chaldean Democratic Forum” starting off its fixed and constant attachment to democracy was an approach and a civilized style that we never divert from in all of the Forum’s work and activity. It has launched its true call to make its project a political secular system for the Chaldeans as they are considered to be a fundamental part of our people’s national components overstepping the dignitaries’ borderline starting off the preparatory Committee of the Forum to launch, widen and contain as much area as possible from our people and on top of them the organizations, gatherings, dignitaries and all the active people in the national area though our people are suffering from the scattering and distribution in the Homeland and all over the world. Accordingly, our Forum has put its call forward in last year’s, viz. 2003, November under the title “For the Sake of Building and Unity - The Chaldean Democratic Forum - A Call for Open Dialogue”. This document included a number of ideas and satisfactions which have been got to by studying our people’s true state of affairs on different levels, not to mention the studying of its factual, deserved and legitimate ambitions. In addition to studying the overall political factuality in Iraq after liberating it from the fist of the dictatorship which enhanced the democratic life and widened the area of the political work on the national levels in particular. The document has also included a number of topics for discussion and basics about which our Forum thinks the importance of holding discussion and dialogue because of the capability and importance they have for the formation of the Forum. In spite of the limited capabilities, the Preparatory Committee was able with the help and support of many sisters and brothers, who commendably offered lots of efforts and subsidization, to convey this call to a big number of our people and its organizations and parties on different geographical areas on which it exists and on top of them, Iraq. The ways and means of convey varied; some were direct through many extended meetings and symposia, others were through the internet as there was a symposium at the internet through the generous commendable host by Einkawa Room. We have also contacted a number of national establishments and organizations. It’s worth noting here, too that this short period of time has witnessed a number of activities and contributions in different political, solidarity, and social domains which had a good impact on wide circles of our people. We think that the available period of time, viz. (six months) and the expansion and density of the activity, the dialogue and the discussions during this period, and the wide geographical area it contained and the variousness of ideas, orientations and gatherings that contributed in enriching it, was a great opportunity that provided lots of experience, ideas, notes, interpositions and studies. We’ll spare no effort and do our best to enrich ourselves and ask for more of such activities to deepen, direct and complete the project of building and establishing our Chaldean Democratic Forum. While we are in respect of general and comprehensive evaluation of the whole activity and the big response to our humble call, we should express some preliminary notes and evaluations of some of the main aspects and orientations for this study and follow-up. First: Generally, the response was big and trust consolidating which granted us hope and optimism to go forward in completing the project and going through it successfully. Second: Our call has contributed to the consolidation of a sincere discussion and dialogue and the subject at stake in our national area. We can say with high confidence that the atmosphere of the dialogue and the enthusiasm have attracted a good number of educated circles of our people to seriously and practically contribute to the national action. It’s worth noting here, too that this atmosphere has enhanced and refreshed the spirit of democratic competition among the organizations and establishments acting on the national area that will undoubtedly contribute to the direction of placing our nationality and its legitimate rights in the right position inside the new Iraq. Third: Most of the opinions and interpositions have confirmed the importance and necessity of finding formulae for cooperation and coordination among different national trends and organizations and the necessity of finding a clear national program that relies on the basic constants of our people’s rights. Fourth: In spite of receiving many studies and interpositions which included important ideas and notes that are worth praise and concern, there are distinct participations that have been characterized with courage, clarity and objective, deep and comprehensive understanding and have coordinately expressed between the national action and the variousness of orientations and organizations connecting with the factual understanding of democracy and the relation of the concept of wider nationalism with the narrow nationalism. We see here that we must praise the brothers and masters from our people, namely “Saeed Shamaya, Gorgees Oraha Mansour, Sami Al Malih, and Samir Kattola” for their great carefulness and sincere effort they demonstrated in their studies and interpositions to deepen and develop our approach and speech. Fifth: Most of the opinions confirmed the necessity of establishing the Chaldean Democratic Forum so that it may take its role and natural position in the national action of our Chaldean people and offer a real and serious contribution to enhance and hold together the unity of our Chaldio-Assyrian Syrian people. Being considered as an organization - a democratic and national trend that connects thinking and politics with the objective factuality without addition and exaggeration, the Forum, in this meaning, does not express the overall intellectual and political trends in the national action. The preparatory Committee of our Forum is facing big pressures from many of our people who express the necessity of the rush in convening the Constituent Conference of the Forum. The Preparatory Committee was working, activating and coordinating with many of the brothers who adopted our project in Iraq to seize the initiative in preparing to convene the conference there. However, because of the deterioration of security conditions and the difficulty of transportation and communications, it has been agreed to convene the Constituent Conference of the Forum in Northern America (America and Canada) for the availability of all the Constituent prerequisites before any other areas. On condition that this position be a supporter and assistant in establishing other organizations of the Forum and on top of the list in Iraq. Sixth: Some contributions and dialogues were confined only to the name “Chaldean” and they kept away from contribution about the essential being of the project which confirms the unity of our nationality and the importance of concentration on the necessity of representing all of our people in the national project. 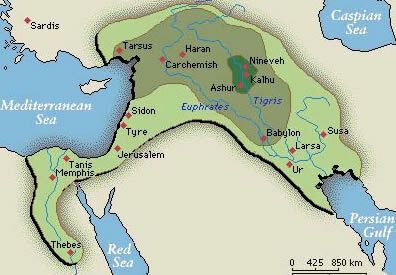 As for the names, they are factual reality that no political trend can refuse and look down upon, not to mention that the names our people owned throughout its journey which extends back to thousands of years, are a source of pride for every Iraqi because of the civilizations and grants they symbolize to which all the world testifies. How is the case then when somebody claims the Nationality? Seventh: Alas to say that there are still a number of uncivilized phenomena and cases that settle in the minds and satisfactions of not only some people in our nationality, but also in the practices of many of our institutions and their political parties. Examples of some of these phenomena are: the tendency of expelling and undermining others, means of suspicion and defamation without any proofs, personal nonobjective positions, tendency to harmful blocs, not accepting criticism and many other harmful deformities and diseases which for a long period of time predominated all of the party and political work in Iraq. Therefore, we pledge you that we in the Chaldean Democratic Forum will keep to our care and attention in following the approach of the Democratic Principle morals and we’ll do our best to respect all the powers and trends irrespective of our compatibility or contrariety with them. We’ll also keep to making the best relations, cooperation and coordination formulae with them. Finally: we should express our thanks and appreciation to whoever responded to our call and expressed his/her interest in our project whether it suits him/her or not. We assure our observance of persistence and continuation to get to the best means, formulae and programs to enhance the role and the position of our Chaldean people and our valuable nationality. The enactment of the Country’s Administration Law for the Interim Period in Iraq by the Governing Council is an advanced step on this way as the name of our nationality and its legislative rights, likewise the other components of our great Iraqi people, has been established for the first time in the history of Iraq. The city of Södertälje in Sweden has chosen the phenomenal Assyrian basketball player, Mrs. Nahrain (Nina) Baresso, as its ambassador to all regional and national civic and cultural activities in which the city participates. 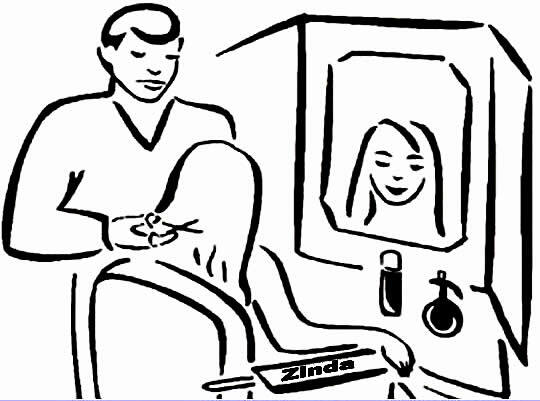 Mrs. Baresso was featured in a Zinda editorial earlier this year (click here). The city of Södertälje bestowed this honor on the Assyrian Golden Star, as she is affectionately known in Sweden, after her great success in last year's Swedish Women Basketball League (the Damligan). Her team, the Solna Vikings, won the national championship because of her efforts and contributions. This year, Nina switched teams and is playing for the Telge Energi. Her team is second in the standing at this point after the Visby Ladies. 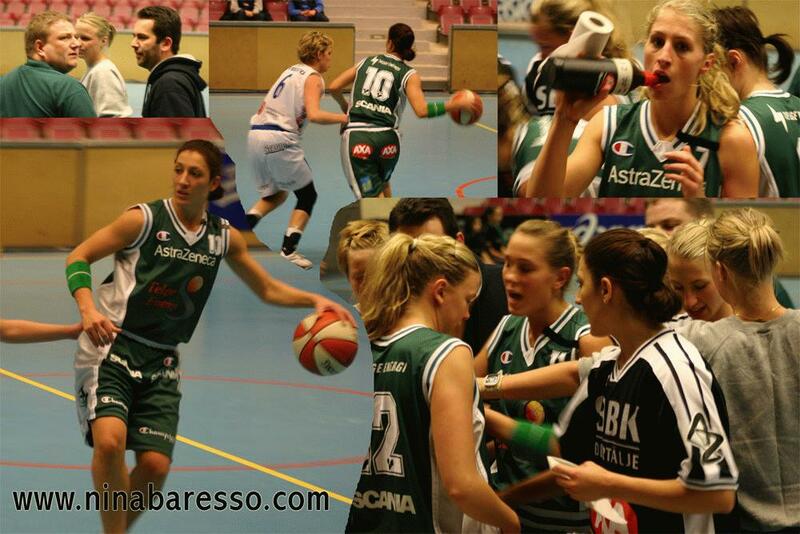 Nina has promised her supporters to win Swedish women basketball championship again.